Bman's Blues Report: Nina Simone's first recordings, 'Mood Indigo: The Complete Bethlehem Sessions,' coming Feb. 9 from BMG. 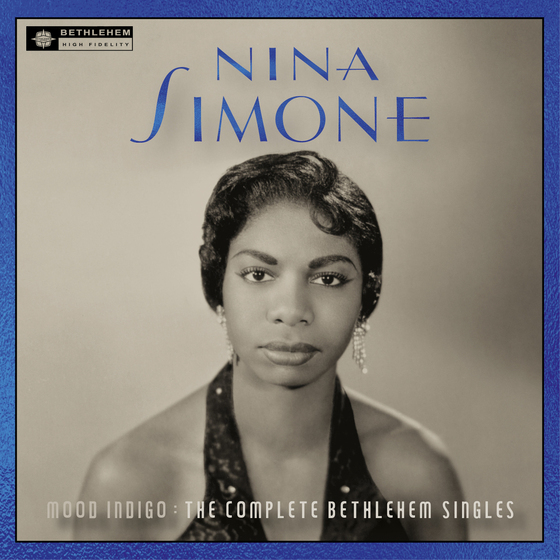 Nina Simone's first recordings, 'Mood Indigo: The Complete Bethlehem Sessions,' coming Feb. 9 from BMG. for Simone’s landmark debut album Little Girl Blue. LOS ANGELES, Calif. — Nina Simone was only 25 years old in 1958 when she entered Beltone Studios in midtown Manhattan for a one-day recording session for her debut album, Little Girl Blue, on Bethlehem Records. The 14 songs she recorded that day reveal just how well developed Simone’s sound — her powerhouse vocals, her classically-trained piano-playing, her inventive, genre-blind arrangements, and her dynamic personality — already was. Bethlehem, a small and financially faltering jazz label, picked 11 tracks for Little Girl Blue. This unheralded debut yielded Simone’s biggest hit, a cover of the Gershwins’ “Porgy (I Loves You, Porgy),” as well as her last one, “My Baby Just Cares for Me,” which charted in 1987 after being used in a TV commercial. By the time “Porgy (I Loves You, Porgy)” was moving up the charts, Simone had moved on to larger and financially stronger Colpix Records. Wanting to capitalize on Simone’s hit, Bethlehem made the most of their Simone material. On Nina Simone and Her Friends, they placed “Porgy’ and the three songs left off of Little Girl Lost (“He’s Got the Whole World in His Hands,” “African Mailman,” and “For All We Know”) with songs by her label-mates Chris Connor and Carmen McRae. Between 1959-62, Bethlehem also put out six singles utilizing all of their Simone tracks. To commemorate the 60th anniversary of these recordings, BMG/Bethlehem now has compiled these singles together as Mood Indigo: The Complete Bethlehem Sessions, due out on February 9, 2019. The Bethlehem Sessions displays a young Nina Simone confidently putting her distinctive stamp on the set of jazz numbers and Broadway tunes. She prefaces Rodgers & Hart’s “Little Girl Blue” with a bit of “Good King Wenceslas" and drops a Bach-like interlude into the hot jazz “Love Me or Leave Me.” Although this was her first album, Simone had written in her contract that she could chose the album’s musical direction, and she chose songs she was familiar with from playing in clubs. The session featured Simone performing either solo on piano or backed by bassist Jimmy Bond and drummer Al “Tootie” Heath, two then-young jazz players who went on to lengthy careers. Mood Indigo’s liner notes include a new interview with Heath, who recalls the one-day session with Simone. “She sat at the piano and sang, and that was that … Nina was already Nina by then. She had her sound together — It was quite different. Her piano playing was something I had never heard before because it wasn’t typical jazz or it wasn’t typical classical. It was Nina Simone, it was her stuff.” Heath’s insightful interview is just part of the enlightening liner notes. Penned by Ashley Kahn, the author of the books Kind of Blue and A Love Supreme, the liner notes provide an excellent history on the making of Little Girl Lost, which was filled with its complications, much like the Simone itself. This year not only marks the 60th anniversary of the Bethlehem Sessions, but it will also see Nina Simone being inducted into the Rock & Roll Hall of Fame, on April 14. Simone, who would have turned 85 on February 21st, has never disappeared from the public’s eye since she passed away in 2003. Recent years saw the release of two documentaries about her: The Amazing Nina Simone and What Happened, Miss Simone, the latter a 2016 Academy Award nominee for Best Documentary Feature. What Happened, Miss Simone also is the name of Alan Light’s well-received 2016 biography. Simone’s music continues to appear on TV and movie soundtracks (her tune "Take Care of Business” was used in the closing credits of 2015’s The Man From U.N.C.L.E. film). Musicians, moreover, have long cited Simone as an influence. The song “Plain Gold Ring,” which is on Mood Indigo, has been covered by White Magic, Nick Cave, and Kimbra, while Simone’s version of “Little Girl Lost” inspired renditions by the likes of Janis Joplin, Diana Ross, and Diana Krall. Simone’s career was as eclectic as her music. After leaving Bethlehem, she recorded for the Colpix, Phillips, and RCA labels, releasing more than 25 albums from 1959-1974. She continued to cover standards and pop songs, from Screaming Jay Hawkins’ “I Put a Spell on You” to the Bee Gees’ “To Love Somebody”; from the traditional “Children, Go Where I Send Thee” to the original version of “Don’t Let Me Be Misunderstood.” Starting in the mid-’60s, her music turned more political, highlighted by such memorable tunes as “Sinnerman,” “To Be Young, Gifted, and Black,” “Strange Fruit,” "I Wish I Knew How It Would Feel To Be Free," and “Mississippi Goddam.” The last 30 years of her life, Simone led a more peripatetic expatriate existence. She continued to perform live (especially overseas) but recorded only sporadically. Just as Simone travelled the world, she also traveled down many musical roads. Mood Indigo, however, captures Simone at an incandescent moment — when her sound held both a complexity of style and a purity of youth.